The Stockholm Industry Water Award jury recognized PepsiCo's efforts to increase water efficiency. The global food and beverage company conserved nearly 16 billion liters of water in 2011, from a 2006 baseline, through the application of water saving equipment and technologies, creative recycling and re-use, and by deploying a water management system throughout its manufacturing facilities. Award Committee Member and Director of Water Projects at the World Business Council for Sustainable Development, Joppe Cramwinckel, said: "PepsiCo has set and achieved a high standard for its own operations, and has demonstrated that responsible water use makes good business sense." Ms. Indra Nooyi, Chairman and CEO of Pepsico said, “PepsiCo is honored to accept this award from the Stockholm Industry Water Award Jury. This prestigious award is validation of our water conservation efforts. Reducing our water usage drives cost reductions and reduces our overall environmental footprint, and so we’re innovating to make the most of every drop of water used. 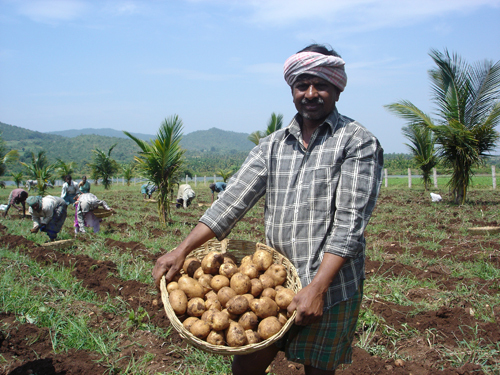 Potato farmer in India harvesting crops as a result of PepsiCo's agriculture and water conservation efforts. 2010: Photograph courtesy of PepsiCo. PepsiCo said “PepsiCo's water commitment has not stopped at the factory walls. By assisting farmers in growing more water efficient crops, implementing better agricultural practices and irrigation techniques, and by supporting watershed management initiatives, PepsiCo has saved water all along its agricultural supply chain. 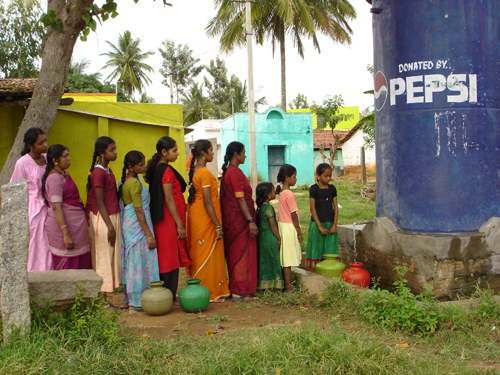 PepsiCo India - Community rainwater harvesting initiative in Nelamangala. 2010: Photograph courtesy of PepsiCo. “In 2009, PepsiCo was among the first large companies in the world to recognize and to formally adopt the human right to water. The company has established numerous public-private partnerships and collaborations, which have increased access to safe water and sanitation services around the globe. 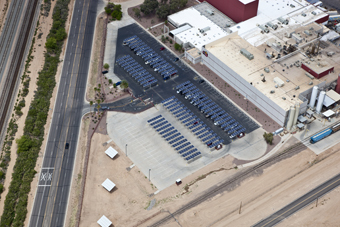 At the Casa Grande, Arizona, Frito-Lay facility, a state-of-the-art water filtration and purification system recycles and reuses: approximately 80 % of the process water used in production. Photograph courtesy of PepsiCo. “We are proud to work with a variety of exceptional partners that help us reach aggressive water stewardship goals. We thank the Stockholm Industry Water Award jury for this recognition,” said Rich Delaney, Senior Vice President of Operations for PepsiCo. The Stockholm Industry Water Award The Stockholm Industry Water Award honors the business sector's contribution to sustainable water management. It recognizes improved performance in production processes, new products, and management, as well as innovative approaches in water and wastewater process technologies which together help to improve the world water situation. The Award was established in 2000 by the Stockholm International Water Institute in collaboration with the Royal Swedish Academy of Engineering Sciences and the World Business Council for Sustainable Development. Nominations for the 2013 Award are accepted until November 1, 2012. Visit www.siwi.org/siwa. About the World Water Week in Stockholm. About the Stockholm International Water Institute.